Another unnecessary loss. I realized tonight how much the irritation has been building up, because for the last eight minutes of the game, I fought hard against my own urge to get up and leave. Anyone who knows me knows that things are really bad for me to feel this way, because I never leave games; I am there until the bitter end. 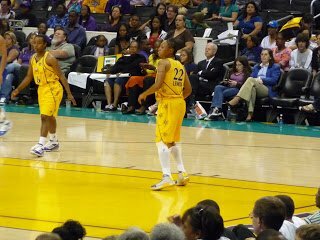 (I also sat through the Seattle Storm’s first two seasons, if that is any example). But tonight I could barely take it, and I finally did get up after the Liberty scored their last bucket with 9.5 seconds left. I waved goodbye to my section friends and walked out as fast as I could. 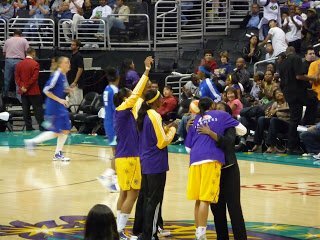 I was almost at the exit door on the Staples Center concourse when I heard the final buzzer. I can’t take the lack of rebounding and the incredibly consisent failure to drive to the basket on every single play. 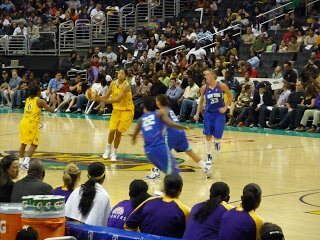 All that perimeter passing looks more like softball than basketball. Fourteen team rebounds? I don’t know what to say, except that it’s not too fun to witness. Judging from the sentiments expressed by others in the stands and in the restroom, I’m in good company. Fans not only don’t understand the lack of boxing out and the standing around passing, they don’t get the substitutions. 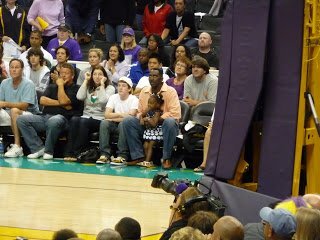 For example, late in the game when Lisa Leslie picked up her fourth foul, Coach Michael Cooper took out Betty Lennox – who was doing very well – and left Leslie in. Fans are saying they think Cooper should just quit now. This team seems to have no energy, drive or motivation sometimes. So many slow and lazy passes this evening; players were going up soft, and that includes Leslie. I’m not going to guess what the problem could be, as I’m not on the team. But one of my seatmates made me sad tonight when she said she might not renew her tickets next year. She’s been with the Sparks since the beginning, so that’s a heck of a statement. Personally, I’m going to think about something else for the next three days. It was nice to see Betty Lennox back in the lineup. She had a helluva game, too, putting up 11 points in just over 15 minutes. 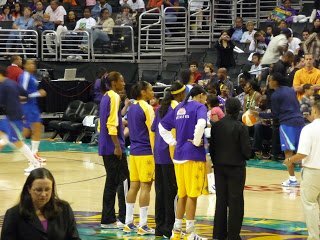 Lisa Leslie, Tina Thompson, Delisha Milton-Jones and Candace Parker receive their Olympic rings in a halftime presentation…. 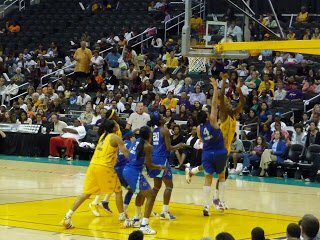 Lisa Leslie tries to score in the third quarter. CP took it up the court most of the way before dishing to Shannon Bobbitt, in the fourth quarter. During the last full-length timeout, Lauren Lockwood was dancing around and jumping courtside, next to dad Michael Lockwood. When the game began again, Lockwood collected baby girl in his arms so they could watch the last minute together. The baby is going to be TALL. I don't get it. The starters were tired. Why doesn't Cooper put in the bench players at least for a few minutes to rest the starters. Maybe that would bring some energy. Also, why didn't Lennox get into the game again? She was hot! Agreed on both counts. And I don't get it either.